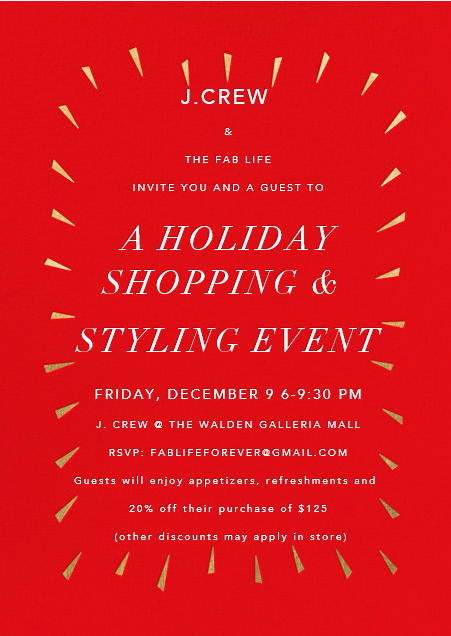 The Fab Life & J.Crew Holiday Shopping Event! Imagine my surprise when I was shopping in my local J.Crew store in Buffalo, NY a few weeks ago and I was approached by one of the Sales Associates who told me that she followed me on Instagram and asked if I was interested in hosting a shopping party at the store. As a once upon a time J.Crew employee in college and loyal shopper for years, I’m always excited to share my love of J.Crew and styling tips with my followers, friends and family and now you can come to the store to get the experience! For the event, the store will be offering a special discount of 20% off your purchase of $125. However, as there are often better deals going on in-store, the better of the discounts will apply. AND if you’re a student or a teacher – bring your ID and you can receive an extra 15% off. The J.Crew at the Walden Galleria Mall features Men’s, Women’s and Crewcuts so you can peruse for yourself or the kiddos! They will have some local treats and refreshments and I will be there to help you with all of your holiday shopping needs. Please check out the Facebook event page or email me at fablifeforever@gmail.com to RSVP. I look forward to seeing you there!